The Downtown Seattle Transit Tunnel is now closed to buses and used exclusively by light-rail trains. If you plan to use any of these routes, check this site to find the exact locations of new stops. Seattle’s downtown transit tunnel, a rare hybrid that has for a decade carried both buses and light-rail trains, has shifted to a single purpose: Buses are out, trains are in. Monday morning marked the first weekday commute since the move, which affects thousands of bus riders coming to and from downtown. If you’re downtown Monday, you’re likely to notice more buses and pedestrians, and staff from local transit agencies out helping people navigate the changes. King County Metro also is deploying security guards near crowded stops, and Seattle police will monitor bus-only lanes, according to the agencies. Seven bus routes that previously used the tunnel — 41, 74, 101, 102, 150, 255 and Sound Transit 550 — now stop along downtown surface streets. Eight other routes that ran along surface streets — 76, 77, 252, 257, 301, 308, 311, 316 — have been moved slightly to make room for more buses. Bus riders should check with King County Metro for information about each route. Apps like Google and One Bus Away should reflect the new stops. For help, call King County Metro at 206-553-3000. 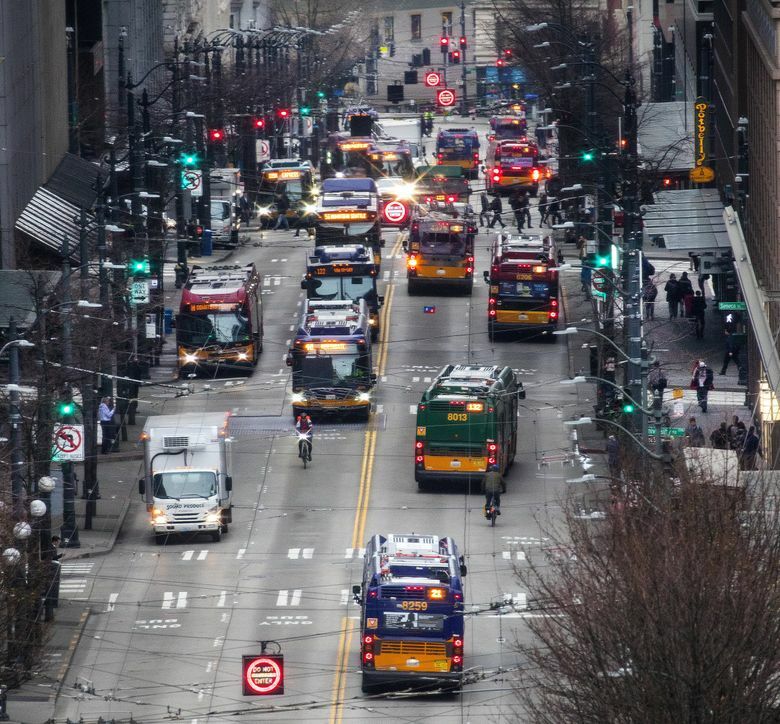 “If you’re used to going to the bus tunnel, remember it’s not a bus tunnel anymore,” Mayor Jenny Durkan said in a briefing at the Seattle Department of Transportation (SDOT) Operations Center Monday morning. Around 7:30 a.m., traffic throughout downtown appeared largely normal, with some hiccups. Behind Durkan, a wall of video feeds from traffic cameras showed a Metro Rapid Ride bus stalled at First Avenue South and South Jackson Street. Drivers faced delays on eastbound State Route 520 after a man was found dead of an apparent gunshot wound in the driver’s seat of a vehicle on the 520 bridge Monday morning. Sound Transit said its buses traveling on SR 520 were seeing delays up to 30 minutes. Durkan and officials from SDOT urged commuters to walk, bike or adjust their work schedules if possible to avoid congestion. 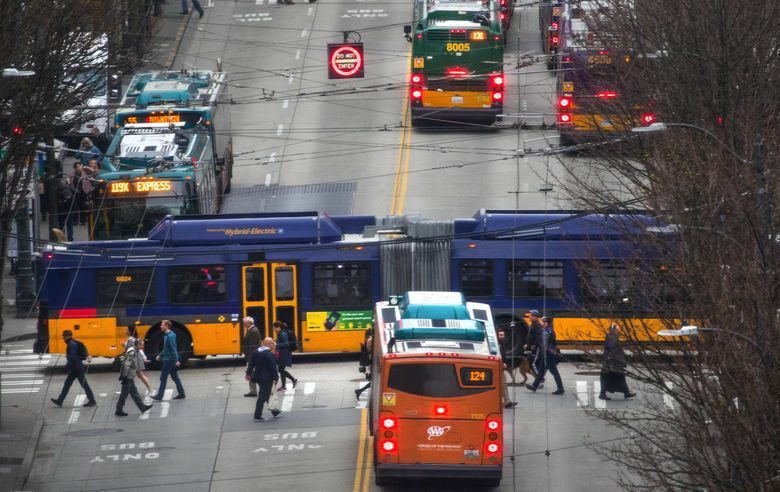 SDOT director Sam Zimbabwe said the city is ready to adjust signal timing as necessary to address congestion, and the afternoon commute is likely to prove more challenging than the morning. Drivers should keep an eye out for increased bus and pedestrian traffic throughout the downtown core, plus new lane restrictions on Fifth and Sixth avenues. An all-hours bus-only lane has been extended on Fifth Avenue, where buses travel against the flow of general traffic. That lane now reaches Marion Street, where buses will turn toward Sixth Avenue. On Sixth, a new bus-only lane will operate from 3 to 7 p.m.
Third Avenue is closed to cars during the day. Bus riders on Third will be encouraged to change how they board the bus, tapping their ORCA pass in advance when they can to speed up boarding. Passengers paying with cash should board through the front door. Metro will use fare-enforcement officers on routes with the all-door boarding, starting with an “education period” through the end of April. The 1.3-mile Downtown Seattle Transit Tunnel opened to buses in 1990. Trains arrived in mid-2009, when Sound Transit opened Link light rail between downtown and Tukwila. The final bus ran through the tunnel in the early morning hours Saturday after a celebration that included a commemorative ride on a Breda. The articulated dual-powered buses were designed to switch from diesel power to overhead electric-trolley lines when they entered the tunnel to avoid pollution inside. But the fleet proved to be somewhat of a nightmare, with hard-to-find and overpriced replacement parts and hiccups with the overhead wire system. Metro ran its final Breda trip in 2016. Closing the tunnel to buses will make room for the Washington State Convention Center’s expansion on the north end of the tunnel and light-rail expansion on the south end. Sound Transit expects it will also make trains traveling through the tunnel more reliable, doing away with delays caused by buses. We want to hear how your commute is going after the removal of buses from the tunnel. Email hgroover@seattletimes.com or leave us a voicemail at 206-464-2003.